April 30, 2010 0 comments on "How to Grow Primroses"
Primroses are one of the first flowers that can be planted in the spring. Depending on where you live, you may even see them in the stores late in the winter. When I see the first primroses, I know spring is just around the corner! I always have to buy a primrose or two to plant in my empty planters in early spring. Learn how to grow primroses so you can add these little gems to your spring flower pots or garden beds. 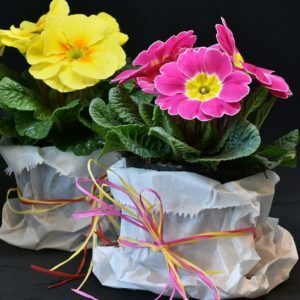 Primroses come in a wide variety of colors, including red, yellow, white, purple, and pink. There are also many different varieties of primroses. Check your local nursery for the ones that grow best in your area. Primroses are great in flower beds, as borders, and also do well in containers. Primroses prefer rich soil and partial shade, which is why they do so well in cool weather. Primroses are very hearty. Once they are planted, they can be easily transplanted without causing any damage to them, even while they are blooming. They should be planted 6 inches apart. After your primroses have finished blooming, remove the dead blooms. Plants can be preserved throughout the winter if you protect them with compost. If they are in containers, you can bring some varieties of primroses indoors during the winter months.